Morris, Garfield, Tigger and Hobbes are just a few of the iconic orange tabby cats that are part of our culture’s collective cat consciousness. It’s not hard to know why. Their big, bold and brightly colored coats is one reason. But, as anyone who’s lived with an orange tabby cat can attest, it’s really their personalities that make them stars. They’re infinitely fascinating felines, so here are eight fun facts about the awesome orange tabby cat! 1. First, the truth about tabbies: It’s actually a coat pattern, not a breed. An orange tabby cat with an “M” marking on his forehead. Photography ©elenaleonova | iStock / Getty Images. Specifically, the presence of stripes denotes a “tabby” cat. And there are five different tabby configurations: classic tabby, mackerel tabby, spotted tabby, ticked tabby and patched tabby. 2. All orange cats are tabbies. Go ahead, Google “orange cats” – they’re all tabbies. Even if their stripes are faint, they’re there. So, while all orange cats are tabbies, not every tabby is orange. 3. Is every orange tabby cat male? While it’s true that a higher percentage of orange tabbies are male, the ratio is actually about 80 percent male to 20 percent female. And it’s not some sort of magic — it’s genetics. The X chromosome is responsible for the orange coloring. Females possess two Xs and males possess XY. Hence, a female orange tabby cat requires the sire and the dam to pass on the orange genes. But males only need the orange gene from their mothers. 4. What does that orange tabby cat “M” stand for? One of the most distinctive markings on the orange tabby cat is the “M” above his eyes. This is seen in all types of tabbies, so it’s not just the orange kitties that boast these cool peeper accoutrements! Tabby stripes are probably predominant because of their camouflage properties, so it’s most likely that the markings helped them hide in the wild. Depending on the orange tabby’s parental décor choices, this may or may not be the case for the modern tabby. 5. Orange tabbies tend to talk a lot! 6. Orange tabbies are known for being Velcro cats. Tiger is an orange tabby cat who loves to be loved. Photography courtesy Karen Stephenson. Every cat is an individual, but orange cats have a reputation for being snuggly attention lovers. In addition to being a real purr machine, MoMo the orange tabby cat seeks affection every waking hour from Amy, and then some. His frequent less-than-stealthy move is to climb up onto her pillow and start climbing around her head for attention. It makes no difference whether she’s awake or not! 7. Winston Churchill famously owned an orange tabby cat. Maybe it’s a little too fitting that the man who said, “Never, never, never give up,” owned an orange tabby cat. That’s right, Winston Churchill shared his life with an orange tabby cat called Tango. He was probably just trying to get some sleep in his own bed when he came up with the famous line. 8. Orange tabbies are the color of appetite. What? The psychology of colors arguably started with Goethe. His writing asserts that red-yellow is associated with “warmth and gladness.” He also claimed that yellow-red possesses the highest energy (apparently causing folks in days of yore to freak out if they saw an orangey cloak on a dreary day). Contemporary findings include that orange is the color of adventure, social communication and, yes, stimulating the appetite (Howard Johnson was onto something!). While it may be a broad brush to paint all orange tabbies in — we can see that there’s definitely an anecdotal correlation between their coat colors and their personalities. Now we know exactly why Garfield couldn’t resist that lasagna! So, whether they’re trying to hog the pillow so you’ll wake up and pet them or purring up a storm so you’ll pick them up and pet them — there’s one thing we know for sure: orange tabby cats are as bright, beautiful and varied as their coats! 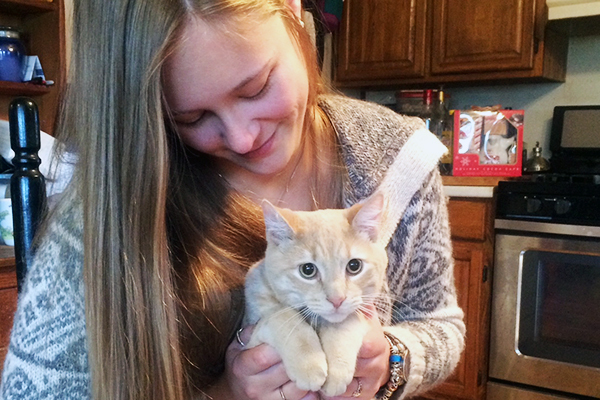 Tell us: Do you have an orange tabby cat? 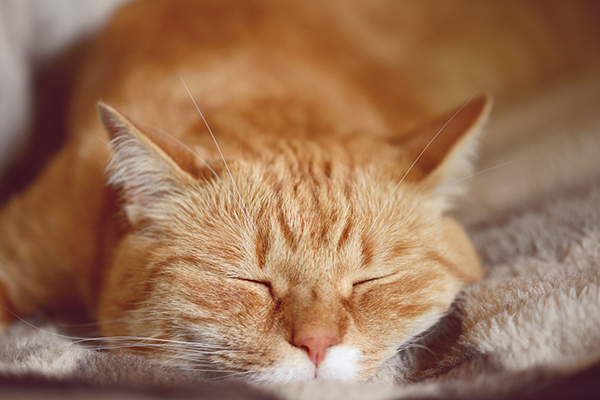 Did you know these facts about your orange tabby cat? Is your orange tabby cat a snuggler who loves to talk a lot? Do you have an orange tabby girl? Thumbnail: Photography ©Ryhor Bruyeu | iStock / Getty Images Plus. This post was originally published in 2018.